Mention that you’re on a women’s masters rowing team and the questions ensue. 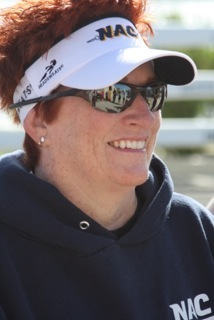 I started rowing when I was 47. I’ve always thought of myself as a ‘water’ person. I was on the swim team growing up and have always felt a certain pull towards, and energy from, the water…whether it’s looking out upon a crystal clear lake, a mesmerizing waterfall, the vast beauty and majesty of an ocean or just our backyard pool. On a side note…I also drink over my required 48 oz of water a day. There’s just something that I LOVE about water! So, when I realized I needed to “get a life” I happened to see an article in the local newspaper about a women’s masters rowing team not far from my home. 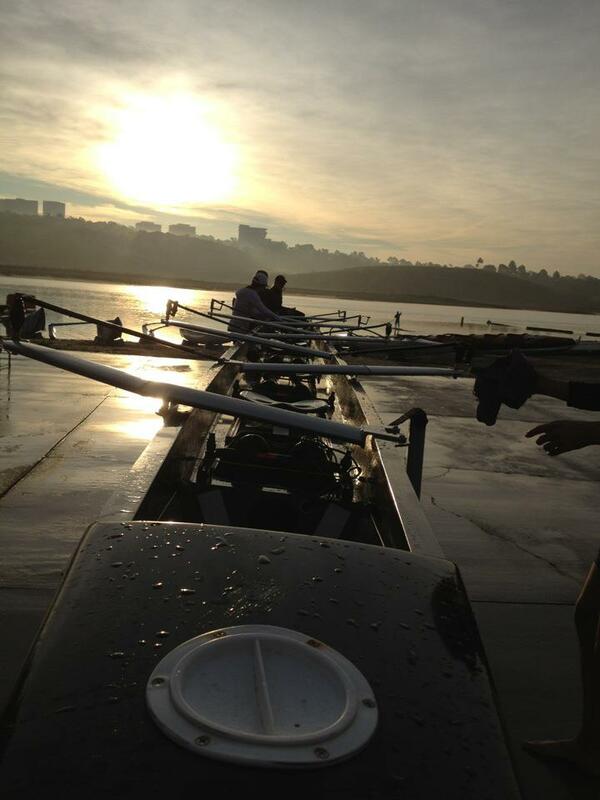 I took a few private lessons, went to the “learn to row” camp and was then invited to join the team. I’ve also always been a morning person, which definitely helps. 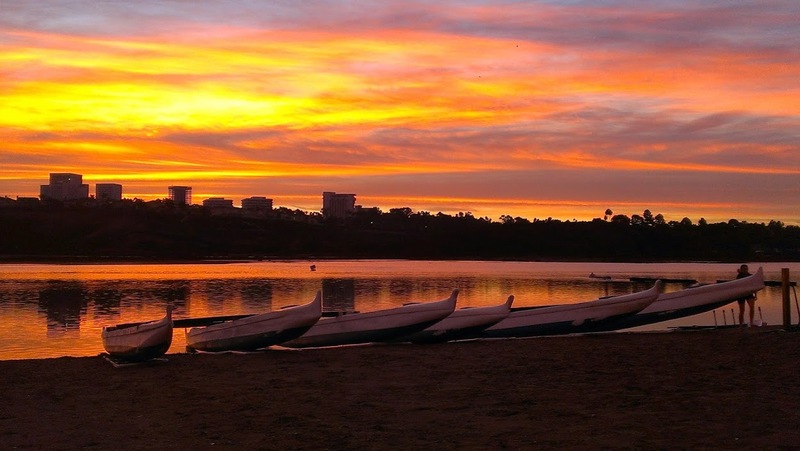 Yes, it was hard at first getting up at 5 am to be down at the boathouse by 6, but eventually it just became my normal waking time. 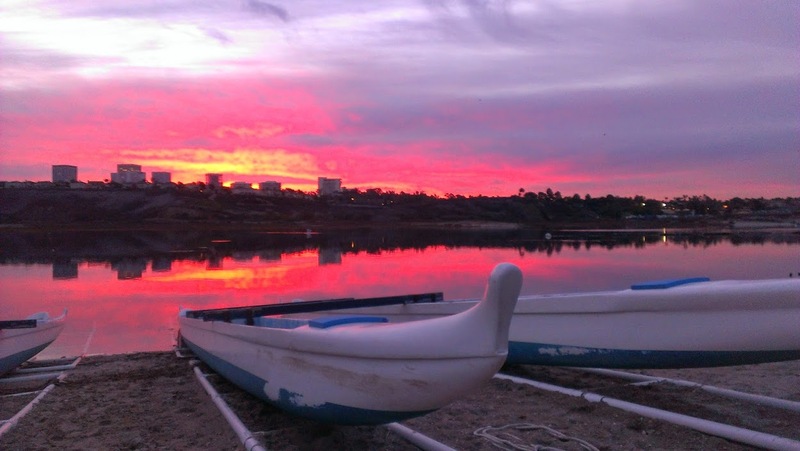 ….and the sunrises, oh the sunrises!! It is honestly hard to put into words the awe, excitement and energy I get from sunrises. Most of the time I arrive at the boathouse in the dark, with the boat bays barely illuminated from within. The wash deck starts to come alive as the sun starts to rise above the mountains in the distance….and if there are clouds involved it is spectacular! Just this morning I said to everyone, “Think of all the poor people still sleeping right now and we get to, not only enjoy the sunrise, but also the magnificent water!” The purples, oranges, pinks reflected on the glassy water is something I cannot adequately describe in words…so here are a few pics. Okay, back to rowing! Yes, it is great exercise, but more than that I like to refer to it as ballet on the water. Eight people moving in unison, working together to propel a 200+ lb shell through the water, making it look effortless….ballet! There are a multitude of things you have to remember when you’re rowing….relax the slide; square up sooner; chin up, chest up; arms, body legs, legs, body arms; tight core; you’re skying; the dreaded ‘crab’….I could go on & on, but I’ll leave that up to the coaches out there. I rowed for 4 years until it was pretty clear that I didn’t have the mental toughness to “get comfortable with being uncomfortable” as we’d been instructed. My time on the erg (the rowers term for that machine you use at the gym) was always slower than most, I’m only 5’ 1” and most of my team members are over 5’7”, and I just couldn’t get past that mental part of going & going when you wanted to throw up, which some have done after a race. 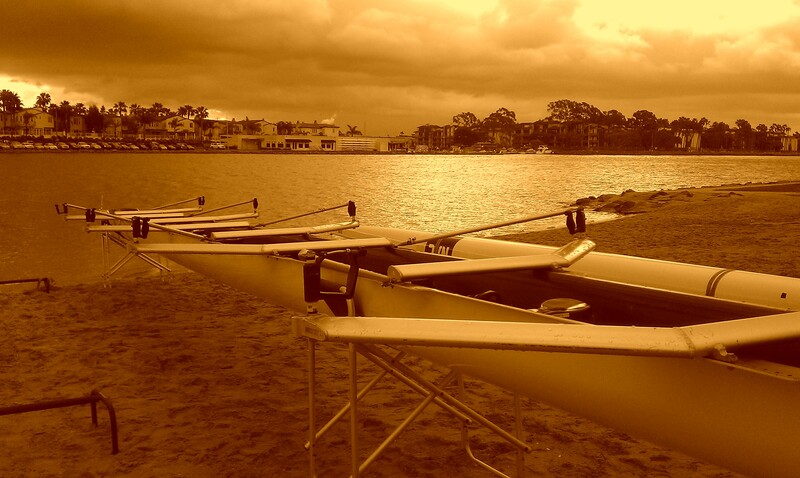 But I loved everything about rowing and our team really needed coxswains, so 2 ½ years ago I switched to the role of coxswain. I still work out on the erg a couple of days a week for exercise, but mostly I sit in the stern of the boat, Madonna mike attached to my head, and, with instruction from our coach, steer and guide the team through practices and ultimately races. I may not have the mental toughness to get through the physical part of being a competitive rower, but line me up next to a row of competitors and I get a fire in my belly. Just imagine being lined up at the starting line, looking left and right at your competition, the starter yells “ATTENTION”, blades lock in the water and the flag goes down. The adrenaline is indescribable, as we battle other teams, hearing the shouts and encouragement from the shore as we all accelerate towards the finish line. I get excited just envisioning it!! 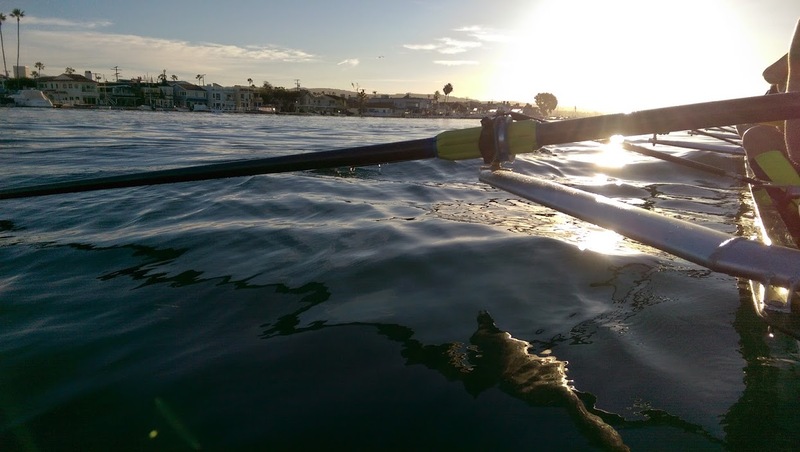 …to be continued…there will be more rowing posts! and read “The Boys in the Boat”…a beautifully written book about the 1936 US Olympic rowing team. Not only a great historical treatise but a fabulous insight into the sport of rowing. Made me a little envious of you, Jeanine! So true..I’m reviewing that book soon..stay tuned! Great blog! For the record – you were a fierce competitor when we rowed bow together!! Ahhh I’m guessing you’ve read Boys in the Boat? Absolutely loved the book, and was such a wonderful look at rowing. So inspiring that you took it up later in life! I don’t row, but I remember watching Amy compete at Bologna Creek – very exciting! Those photos are incredible. I like getting up early and seeing the sunrises here in CT too. Absolutely beautiful, thank you for sharing a great gift you’ve been given.